Le Château de Poinsouze is a well established site arranged on an open, gently sloping, grassy park with views over a small lake and château. It is an attractive, well maintained, high quality site situated in the unspoilt Limousin region. The 116 very large, grassy touring pitches, some with lake frontage, all have electricity (6-20A Europlug), water and drainage and 68 have sewerage connections. The site has a friendly, family atmosphere with many organised activities in main season including a children’s club. There are marked walks around the park and woods. All facilities are open all season. This great site should ensure an enjoyable, stress-free holiday for all the family. Exceptionally well restored outbuildings on the opposite side of the drive house a shop, bar and a restaurant serving excellent cuisine. The pool complex has a superb water play area for children with many fun fountains. 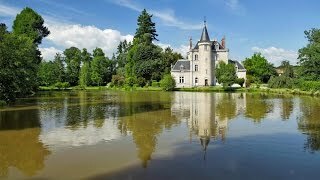 Although the château is not open to the public, campers are free to canoe on the lake and wander in the beautiful grounds. The town of Boussac, with its medieval castle, is only a five minute drive away, and has all the usual amenities. The site is convenient for the A20 and the A71 motorways and is equally suitable for long and short stays. High quality sanitary unit includes suites for disabled visitors. Washing machines and dryers. Motorhome services. Shop for basics. Takeaway. Bar and restaurant. Swimming pool, slide, children’s pool and new water play area with fountains. Fenced playground. Pétanque. Bicycle hire. Free fishing in the lake, boats and lifejackets can be hired. Sports facilities. Accommodation to rent. WiFi over site (charged). No dogs in high season (14/7-18/8). Boussac is 35 km. west of Montluçon, between the A20 and A71 autoroutes. Site is 2.5 km. north of Boussac on D917 (towards La Châtre) and is well signed.